Ballom shines at All-Girls Tourney! Stephanie Ballom is an aspiring doctor who has already won a $30,000 chess scholarship to University of Texas-Dallas. Her father (Adrian Ballom) speaks with fulsome praise of his 15-year old daughter and he'll have a couple of more accolades to tell his friends about. In the 1st All-Girls National Championship in Chicago, Stephanie (age: 15, rating: 1678) was declared the champion after getting better tiebreaks over Medina Parrilla (13, 1825) and Anna Ginzburg (15, 1621), all scoring 5-1. The tournament was fiercely fought as the top four finishers faced off. Parrilla beat Ballom, but lost to 4th-place finisher Emily Lau (16, 1540) who had 4½-1½; Ballom lost to Parrilla, but beat Ginzburg and Lau; Ginzburg, lost to Ballom; Lau lost to Ballom, but beat Parrilla. The highest rated player was Alisa Melekhina (12, 1954) actually in the under-12 section. While Parrilla lost in the overall count, she won the individual under-14 group and her team, MS-318 won the team event! Another proud soul is Ballom's coach, National Master, Dr. David Allen who mentioned that Stephanie won the blitz title as well. This tournament was the first of its kind and is an aggressive initiative to provide more playing opportunities for girls. 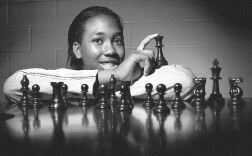 Kay Umeakunne of Atlanta, Georgia will continue this trend when she hosts her 1st All-Girls Chess Camp this summer. Girl Power: Ballom and Parrilla on the rise!